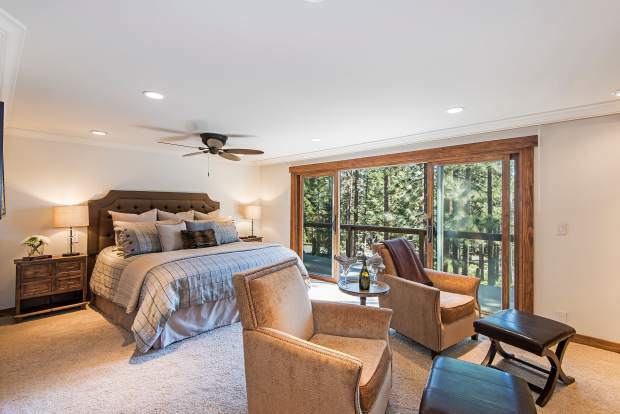 This master bedroom on Saddlehorn Drive in Incline Village has been re-mastered, so to speak, into a fun, modern feel. This story has been adapted from the December/January edition of Lake Tahoe Home, a quarterly magazine produced by the staff at Tahoe Magazine and the Sierra Sun, North Lake Tahoe Bonanza and Tahoe Daily Tribune newspapers. Visit http://bit.ly/2htQeaT to read a digital copy of the magazine, which is available now on newsstands throughout the greater Truckee-Tahoe region. If your master bedroom doesn’t offer you a respite from the hustle and bustle of the day, then now’s the time to transform it. The New Year is right around the corner and filled with wonderfully exciting and new possibilities. The time and money you consider investing now will definitely pay off in big dividends in your future — especially because your bedroom redecorating project might just mean that you’ll find yourself being just a little happier, a bit more joyful, and most importantly at peace with yourself and your surroundings. Decorating your master bedroom is probably more fun than decorating any other room in your home. Why? Because it’s the one room in your home that you can truly allow your personality to shine. Remember, this is your space, and you deserve the best. And, as with every decorating project, first things first — it’s important to develop a decorating plan that fits your needs, your lifestyle and most importantly your pocketbook. Step #1: Begin your project by visualizing, and then listing, all the types of activities you’ll want to conduct in your “get-away” haven. Perhaps it’s writing thought-provoking entries in your daily journal; reading your favorite books; knitting; needlework; watching old romantic movies on your TV/DVD player or daily meditation. Whatever the activity, think through what types of things will make you the happiest in your new master bedroom retreat. Step #2: Look at your bedroom space with a “critical” eye. Ask yourself, can your bedroom, with your given amount of space, accommodate all of the activities you listed. Step #3: Think about “coloring your world” — especially your soon to be redesigned master bedroom. One of your first priorities is locking in a color scheme. Color sets the stage and provides harmony to everything else that will eventually find its way into your new bedroom. It’s the backdrop that surrounds all of your furnishings, fabrics, accessories and lighting!